Compostable Polymer Materials deals with an environmentally important family of polymers designed to be disposed of in industrial and municipal compost facilities after their useful life. These compostable plastics undergo degradation and leave no visible, distinguishable or toxic residue. Environmental concerns and legislative measures taken in different regions of the world make composting an increasingly attractive route for the disposal of redundant polymers. This book provides up–to-date results and information about compostable polymer materials in a coherent and comprehensive manner. It covers the entire spectrum of preparation, properties, degradation, and environmental issues. The emphasis is on recent studies concerning compostability and ecotoxicological assessment of polymer materials-–important issues from the ecological point of view. 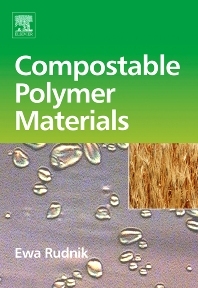 Moreover, the thermal behavior of compostable polymers is described. Their price evolution over the past decade, an estimation of the market and future perspectives are presented. Scientists working in the area of chemistry and materials science, as well as in the fields of ecology and environmental science. It is also suitable for third year undergraduates, graduates, and post-docs. Professor Ewa Rudnik works at the Faculty of Fire Engineering, The Main School of Fire Service, Warsaw, Poland. Professor Rudnik is actively engaged in the dissemination of new knowledge concerning the biodegradation behavior and mechanisms of specific polymers in soil and under composting conditions. In 2002, she carried out the study as a research guest at GSF- National Research Center for Environment and Health in Neuherberg/Munich (Germany). Additionally, Professor Rudnik was a Marie Curie Fellow at the Agricultural University of Athens in the research group of Professor Demetres Briassoulis. Professor Rudnik’s publications address important issues related to environmental safety, including 1 monography, 3 book chapters, publications, seminars, and lectures aimed at scientists and students, as well as people interested in the fields of ecology and environmental science.